I may not be able to sip hot chocolate at the chocolateria in San Miguel de Allende today but I can satisfy my chocolate cravings with this fabulous low-carb, gluten free brownie recipe courtesy of Bob and Kathy in Cuernavaca. Careful, they are addictive! Add cocoa and stir until smooth, Turn off heat. 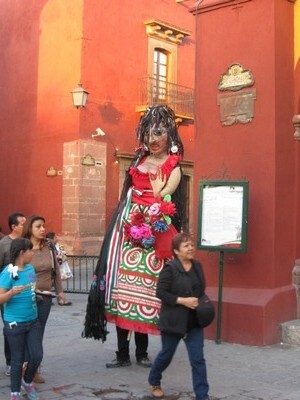 In San Miguel de Allende, when the sun starts to go down, the giants appear. 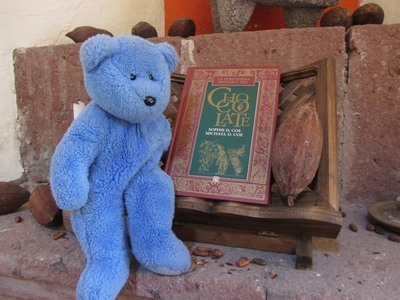 A short walk from the Jardin in San Miguel de Allende, is a chocolate lovers paradise. 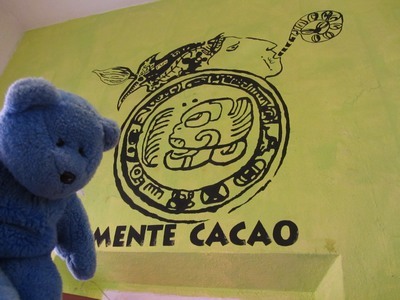 Mente Cacao (mente means mind or intellect not mint), is run by Eduardo and Andreas, connoisseurs of fine cacao. Notice I did not say cocoa, for what they have to offer is much more sublime that your average cocoa or chocolate bar. Eduardo’s family grows the cacao, harvests the beans at the peak of perfection, and grinds them by hand extracting all the wonderful healthy properties of the bean. They mix three different formulas, sweet, semi-sweet, and dark (80%) and serve up the finest hot chocolate that you will find anywhere. With a little cream and raw cocoa nibs on top — it’s pure decadence!!! If hot chocolate is not your cup of “tea” try a blackberry pastry drizzled in hot chocolate, handmade gourmet chocolates with ingredients like citrus peel, dried fruit, nuts, or even chili; if you have never tried chocolate with chili – it is a taste sensation. To keep your chocolate addiction at bay, take home some bars of the sweet chocolate goodness. 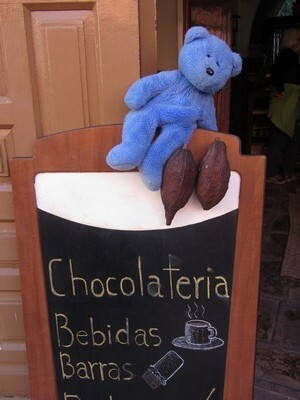 Next time you are in downtown San Miguel de Allende, stop by the chocolateria, on Zacateros near Umaran and savor a little deliciousness. Be sure to tell them Blue Bear sent you. 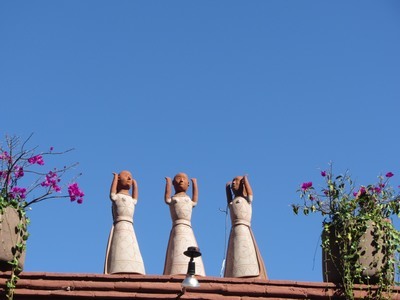 Or is it Three Amigas or Pretty Maids all in a Row? 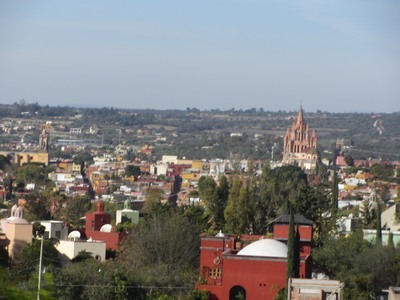 Voted “The Most Beautiful City in the World” by Conde Nast Traveler in 2013, San Miguel de Allende is a Spanish colonial town established in the mid-1500s. 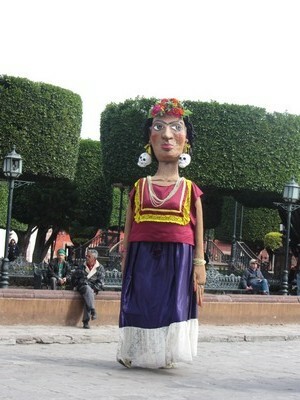 In the center is the typical town plaza, although here it is called “the Jardin” rather than a zocolo. Grand hacienda style casas ring the Jardin, now filled with restaurants, shops, and a museum dedicated to Ignacio Allende (considered the father of the Mexican revolution) and the history of the city, the founding families, and the revolution itself all facing (more or less) the Parroquia de San Miguel Arcangel, built in the 17th century. The facade was reconstructed in the 1800s by an indigenous brick layer and self-taught architect who drew his inspiration from lithographs of Gothic style churches from Europe. 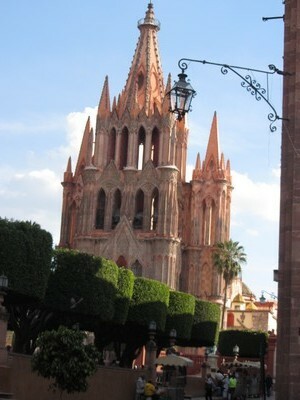 It is really a fanciful creation in multicolored stone that has become the symbol of San Miguel and one of the most photographed churches in Mexico. 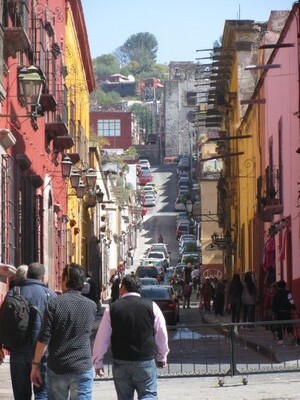 Being a Spanish colonial town, the cobblestone streets are laid out in a grid, allowing for some adjustment due to terrain. 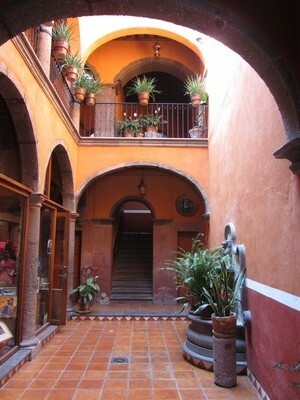 The houses are hacienda style which means they are walled all around, with large doors that open onto a courtyard. Though originally these walls would have been plain stucco, today they are painted golden yellow, brick, clay and other warm rustic colors. 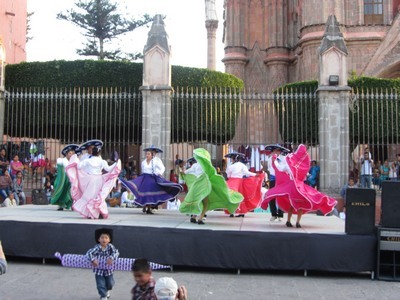 It is one of Mexico’s “Puebla Magicos” (magic cities) and as such rises to a higher level of beauty, cleanliness, and enjoyment that attracts tourists from all over Mexico and around the world. Many Americans and Canadians either live or winter here so English is widespread. It helps to have some knowledge of Spanish but you can get by without. There is always someone nearby to help you if need be. There are many hotels here that would rival any hotel room in the States or you can choose, like I did, to go Mexican. Thanks to some friends of a friend, I ended up in an old hacienda, complete with courtyard and very Mexican accommodations. This was good in that my rooms (it was a 2-story place) were quaint, tiled, and painted in the Mexican style (similar to rosemaling), centrally located, and an easy walk to almost everything. On the other hand, being that Mexican houses are all cement and tile, designed to keep you cool, and the night I arrived it was 36 degrees (yes that’s right – just above freezing) it was freezing inside. I had a fireplace to take the chill off the lower room, however the wood was more like kindling and there were no matches. There was a kitchen but the gas was not on, and again no matches. They did see fit to pile a few more blankets outside my door, so with those and moving upstairs to sleep I was fairly comfortable once I figured out how to capture the heat during the day. 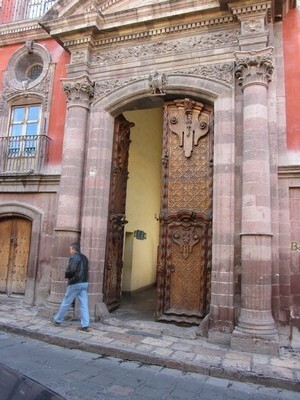 When you walk the streets of San Miguel, the walls are broken by huge doors, many centuries old, many newer and designed to look that way (it’s the law). Shops selling everything from handmade leather bags from Leon, to pottery from Puebla, to traditional embroidered clothing and more from Oaxaca, fill the individual spaces originally designed for this purpose or spill out into a courtyard lined with shops of many kinds. The world famous San Miguel shoes designed by a little old lady and her cobbler husband to provide a stable, cushy, yet elegant way for women to navigate the cobblestone streets is here as well. Martha still holds court in the shop everyday dressed like something out of Anna Karenina — long coat, old fashioned hat, and these crazy shoes. If you are fortunate, you might come across an open door to a courtyard of a private residence. Then you get a glimpse of a sunny garden around a central fountain, offset by old-world tile, ancient wooden doors, wrought iron railings and beautiful architectural details. You might also come across the Inquisitor’s House across the street from the torture chamber (in use for this purpose until the late 1800s), a restaurant where you can eat in the kitchen and many rooftop bars and restaurants with fabulous views of the city. 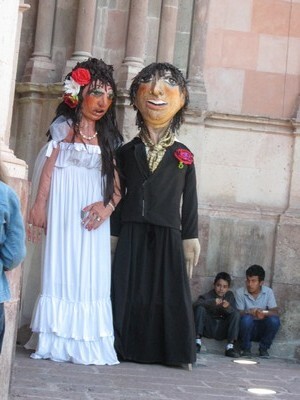 On weekends there is a party atmosphere between the Jardin and Parroquia with giant street puppets, singers, dancers and more. Every corner sports its own unique atmosphere from a mariachi band providing accompaniment for the shoe shine man’s wife’s singing, to the amateur opera singer serenading a table of friends, to the guy with the guitar and pan flute playing for change. 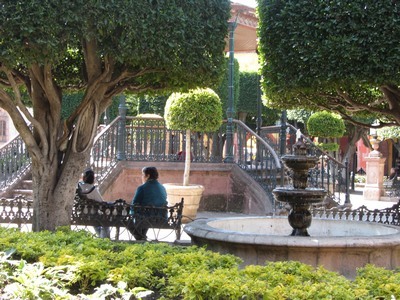 The atmosphere is very artsy, with two schools teaching painting, drawing, ceramics, fabric weaving, music, and more, and many artesaninas (artisans). The specialty of this town appears to be pewter — a good, non-breakable gift to take home. A different kind of eye candy. 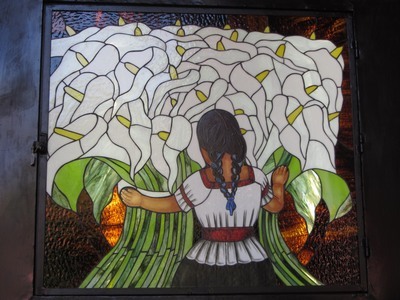 Abundant in Mexico, these beautiful flowers decorate many things, nothing more beautiful that this lighted cabinet though. This artist is fantastic!!! If I had the funds and the location for it, I would take this home with me. The next time you complain about mowing the lawn, think about this guy. 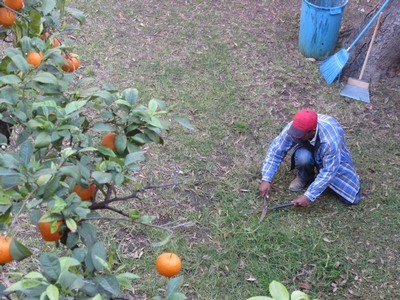 It may not look like much here, but he had a whole courtyard to tend.